The world is changing and the latest change is based on sustainability. This drive affects all areas of life, not just in the field of energy. However, it is a change in the way society draws its energy that will have the greatest impact on this transition to a sustainable life. As the population of the world has increased rapidly, going from five billion in 1987 to seven billion in 2012, our energy demands have also increased in an ever-accelerating manner. This energy demand is met currently through conventional natural energy resources. These resources, while considered to be a blessing, have turned out to be something of a mixed bag. While credit is deserved for being the source that underpinned the development of society on an unheard of scale, these energy resources are also polluting in nature. In addition, these natural energy resources are finite. As only a limited number of countries worldwide are oil producers, the issue of energy security comes into stark focus. Being finite and polluting are reasons enough to warrant this shift to cleaner sources of energy, and the possibility of gaining energy security and/or energy independence is a status that is very appealing to all countries. By adopting clean energy resources - zero emissions when utilized and infinite in volume - such a status could be achieved. This long road is structured on harnessing the power of the Sun, wind, oceans, rivers, and organic matter to generate electricity. 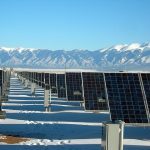 This return to the past will be immensely beneficial, and with recent developments in the solar energy industry, it seems nature still has a lot more to offer and inspire humankind to achieve this lofty goal. The improvements to solar energy technology have been impressive, such as going from the conventional and bulky first generation solar cells/modules to the flexible second generation thin-film solar cells/modules. 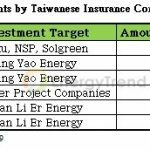 Accompanying this has been a significant reduction in the cost of manufacturing solar cells and modules, with an average price of roughly US$1 per Watt for first-generation and second-generation modules. With further technological breakthroughs expected in the next few years, the future is rosy for the solar industry. However, instead of patiently waiting for this next wave of advancements, academics have devised ways to further tweak solar energy technology and these tweaks are based on observations in nature. One inspiration nature provided was on how to improve concentrated solar power systems by adjusting the layout of the heliostats, and another nature-derived inspiration concerns the study of butterflies and how they could help improve heat collection for solar energy. What is fascinating about the study on butterflies was that a second benefit was discovered concerning the generation of hydrogen gas from water and sunlight. Concentrated solar power (CSP) systems are based on the concept of using large mirrors or lenses to concentrate sunlight to drive a heat engine which goes one to generate electricity (more information on CSP systems can be found here: Making Use of a Focused Beam of Sunlight: CSP Systems). One approach to accomplishing this is by utilizing a field of mirrors or large lenses (called a heliostat) that directs sunlight to a central receiver located at the top of a solar tower. Figure 1 is a photograph showing this version of a CSP system. Figure 1: Photograph of the 20 MW Planta Solar (PS20) project, the world’s largest commercial solar tower-based CSP installation located in Andalusia (Spain), showing the heliostats and the solar tower.Credit: Abengoa Solar. One such improvement, based on an occurrence in nature, concerns the arrangement of the heliostats. 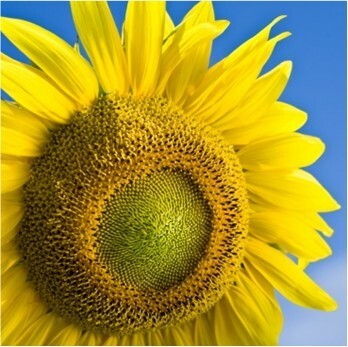 This nature-based inspiration has resulted in a greater yield of energy and a reduction in the amount of land used, and all by adopting the spiral formation found in the face of a sunflower (in the florets, not the petal arrangement). In January 2012, researchers at the RWTH Aachen University (Germany) in collaboration with researchers at Massachusetts Institute of Technology (MIT) in the USA produced a computer model that might pave the way for improved CSP design. The model tweaked the layout from the conventional structure of concentric circles to one based on a Fermat spiral. In the world of botany, phyllotaxy refers to how leaves are arranged on a plant stem. The arrangement is usually structured so as to maximize the gains of the plant/flower to its surroundings. Take, for example, the sunflower. The florets are arranged in a Fermat spiral so that each floret is exactly 137.5 degrees away from the next. This is known as the ‘Golden Angle’, a geometric relationship that describes the ratio between the total sum of the quantities being equal to the ratio of the larger quantity to the smaller one. This ideal proportionality allows for efficiency as well as being aesthetically pleasing. Figure 2 shows a photograph of the Fermat spiral found in a sunflower head. By theoretically applying this geometric arrangement to Abengoa Solar’s Planta Solar 10 (PS10) CSP project, research at MIT and RWTH Aachen University discovered that the heliostats could be arranged more efficiently and this could translate into costs savings and potential energy efficiency gains. The alternate arrangement produced in a 10% reduction in the use of land without affecting the efficiency of the mirrors. This Fermat spiral configuration resulted in efficient packing of the heliostats (much like a sunflower floret) and reduced the blocking or shading issue currently experienced by CSP projects. 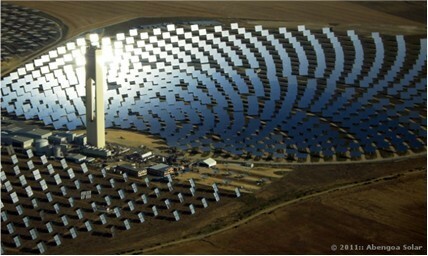 The inference is that this will have an effect on the efficiency of the CSP project. While this piece of research is a theoretical one and hasn’t yet been tested or proved commercially, the results are promising. As heliostats account for roughly one-third of the cost of installing a CSP project, a 10% reduction will translate into a considerable cost saving. In addition, as shading/blocking can have an effect on the operational status of a heliostat, minimizing this characteristic will be beneficial. A butterfly is the inspiration behind a recent development concerning advancements to the rate of solar collection and to the area of energy storage. Butterfly wings are extremely delicate yet harvest solar irradiation in an efficient and sophisticated way, helping the butterfly to stay warm. By understanding the principles of heat collection within the butterfly wings, researchers hope to apply this knowledge to thin-film solar cells and to the production of hydrogen (a clean-burning fuel) for use as an energy storage device. In March 2012, Professor Tongxian Fan of the Research Institute of Composite Materials at Shanghai Jiaotong University (China) published his research on investigating butterflies as a means to understand solar harvesting, in particular, the black butterfly. As a color, black absorbs the most amount of sunlight and reflects the least. For the black butterfly, Professor Fan and his team used an electron microscope and discovered that the scale architecture within the wings were far more advanced and structured than previously thought. Professor Fan discovered that, although slight variations exist between different butterfly species, a commonality existed. This common feature was the presence of elongated rectangular scales that overlapped each other, and running the entire length of this architecture were openings that led to an underlying layer. The arrangement maximized the amount of sunlight retained by the butterfly. The steep walls of the ridges of the scales absorbed sunlight at longer wavelengths, while the openings along the ridges acted as a filtering system and allowed for only lower wavelengths of sunlight to reach the lower layer. Figure 3 is an electron micrograph showing the elongated scale arrangement found within the butterfly wing. 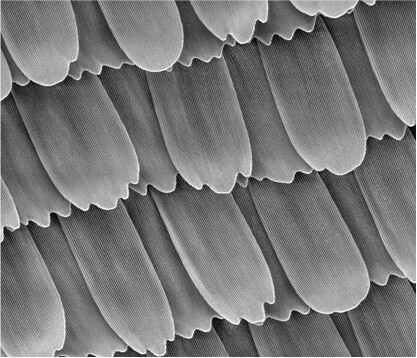 Figure 3: Electron micrograph showing the arrangement of elongated scales found in the wings of butterflies. Credit: Tongxian Fan. Using the actual wing structure found in the Red Helen swallowtail butterfly as a template, Professor Fan and his research group dipped the wings into a solution of titanium and then calcinated the dipped wings (through a process known as dip-calcining), followed by pairing the treated wings with platinum nanoparticles. Testing this butterfly wing-treated compound catalyst resulted in double the production of hydrogen gas. This means that as an energy storage device, this treated catalyst will split water molecules into hydrogen gas and oxygen molecules twice as fast, providing a significant boot to the development of energy storage devices. As solar energy suffers from only being useful when the sun is shining, storing energy has become one of the biggest challenges to fully harnessing the power of this clean energy resource. And with this development from professor Fan, solar energy might just be on its way to becoming a twenty-four hour on-demand energy source. For millennia, mankind has looked to nature for inspiration and guidance. And even in these modern times, nature has provided clues on how improvements could be made to current technology. Understanding the arrangement of florets in a sunflower has led to a more optimized layout, decreasing the amount of land used and potentially offering a higher operational efficiency. By investigating the structure of butterfly wings, insights have been gained on how this insect is able to efficiently retain heat. This insight has led to improvements to the design of solar cells, with a particular focus on thin film solar cell improvements. However, the bigger gain is to the field of energy storage. With this deep understanding of the butterfly wing structure, and how more heat is retained, the design could be used to boost the efficiency rate of energy storage devices that rely on splitting water molecules. In this modern age, with efforts being made to move the world from consuming polluting fossil fuels to using cleaner sources of energy, these developments stated in this article highlight how nature has once again provided answers allowing for technological progress.